We view our service from the client perspective. Our Founder started this company because as a client, he found all available options subpar and decided to do something about it. 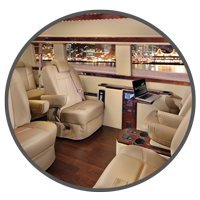 We view your travel with us as an experience - not merely transportation between points. From the beginning, we disrupted and innovated traditional ground travel with a modern interpretation of everything from our fleet, to chauffeur uniforms, to the online and booking experience. We really do. We don't make excuses, tolerate mistakes or accept mediocrity. We view our service from the client's perspective. Our Founder started Brilliant because as a client, he found all available options subpar. We view your travel with us as an experience - not merely transportation between points. Brilliant's culture is by design, and something we are most proud of. We've assembled a cohesive team of industry experts and innovative minds. Constantly underwhelmed by transportation services in his previous career as a hedge fund manager, Richard Fertig set out to create Brilliant Transportation. We march to the beat of our own drum, and we like our Brilliant vibe. Every member of the Brilliant Team is pushed to think outside of the box and it shows in the travel experience our client's receive. Take an inside look at what makes Brilliant's culture unique.